St Joseph was born into a peasant family at Castelnuovo d’Asti, Italy. Having decided, at an early age, to become a Priest, he entered the seminary of Turin. After his ordination, he continued to teach at the seminary as well as at Turin University and the Institute of St Francis. He is one of the so-called “social saints” which includes Don Bosco (1815 – 1888) and Maria Mazzarello. 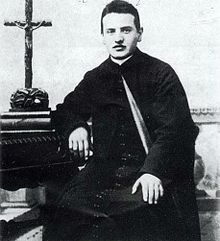 He met St John Bosco when St John was around 22, the two became close friends and he greatly influenced St John’s decision to care for young disaffected youth in Turin and establish the Salesian Order. In contrast to St John Bosco, St Joseph devoted his life to the dispossessed, marginalised and prisoners. He became known as “The Priest of the Gallows” through his work as confessor and comforter of those condemned to death. St Joseph is fondly remembered as a pious and holy man, who devoted his entire life to honouring the Blessed Sacrament, preaching, teaching and reaching out to the unwanted. St Joseph is Patron Saint of Italian prisons, prison chaplains, prisoners and those condemned to death. His Feast Day is June 23rd. Pray for us that we will see the repentant sinner and help them to find the merciful Jesus.